As I was at the library choosing picture books to read to my 6 year old, I was struck by the large number that take place on a farm, or that involve farm animals. Since I would guess most picture book writers don't live on farms, what is it about farm life that draws us to write about it so much? Or is it just my library, ? I think farm animals hold a lot of potential for humor. Just the sounds: "moo", "oink", "quack". They just sound funny. Also, a farm has a diverse range of animals so I think that lends some appeal. I'm not particularly drawn to farm stories in general. But I've read a number of farm stories that I really enjoyed. I think some stories just lend themselves better to certain settings. Kids are naturally attracted to all sorts of animals. Parents/grandparents who were raised on a farm have a desire to share that with the kids who live in towns or cities today. And what Carol Anne said so beautifully. I agree with psychwriter. Also, I think we attach certain personalities to the different animals (fussy hens, not-so-bright sheep, stubborn mules, etc.) and these make for some really fun picture book characters. There are a TON of them on the market and clearly children LOVE them. But I think in order to make it today you really have create something wildly different to be noticed. If I were to do one I might go with that. I love reading--and writing!--pbs with a barnyard setting. They have so much opportunity for humor and mayhem. Two of my upcoming books are Chicken Dance (Sterling, Fall 2009) and Duck Means Business (S&S, Forthcoming). Chicken Dance stars Marge and Lola, two chickens who want nothing more than to win the grand prize at the barnyard talent show--tickets to see Elvis Poultry in Concert: The Final Doodle Doo. Duck Means Business stars a duck who goes a little haywire when the barnyard animals show up for a surprise swim in his otherwise peaceful pond. I just like cows and they're fun to draw! I grew up in MN, so even though I didn't grow up on a farm, we drove past lots of cows. There are probably a lot of other people that don't live on farms but drive past land with cows and horses on a regular basis. It would make sense that they would like farm stories. They may not see all the other animals when they drive by the farms, but they can find out about them in the books. Maybe. Just my 2 cents. In other words, the beginnings of children's literature were rooted in a more rural time. Many children grew up on or near farms, so it was natural for children's books to reflect that. In a similar way, certain organs once played a more prominent role in the development of the human species. The appendix may have helped digest large amounts of cellulose when our diets included more grasses. Despite our increased urbanization, we still cling to the ideal of farm life, as echoed by others in this thread. Plus, farm animals are fun, and kids love animals! So while the number of farm books available no longer accurately represents the centrality of farm life for children, they still persist. And so does the appendix! Tammi, your two "barnyard" books sound like a lot of fun! I think farms, zoos, and jungles are great settings to show diversity (different animals living in harmony together even though they don't look the same) without getting too PC or worrying about quotas (did I put enough minorities in? are there enough "ethnic" names? and by the way, the rant I could start about "ethnic" names -- like all names aren't ethnic!). And pigs are cool. That's why I like the farm. Sudipta...nice seeing you around here again. I'm really looking forward to reading The Hog Prince. I think there are so many farm books, because kids like animals. There are lots of great animals on the farm. My favorite is Farmer Duck by Martin Wadell and Helen Oxenbury. 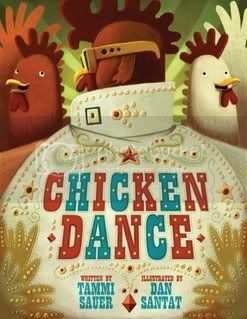 Tammi, I hadn't seen your chicken dance cover until now --LOVE IT!! I think farm books are successful in part because they are familiar, appear safe to kids, usually have vocabulary that is accessible, and while it's a setting that seems very realistic, it's a perfectly defined world for fantasy. Also, I agree with Ellen, kids like animals and farm animals make the best sounds, don't they? And I have to say that reading Sudo's comparison between the appendix and farm settings made my night! When I was younger and I'd see movies with wide open, expansive fields, I had SUCH a desire to lay down in one--breathe in the smell of fresh grass, enjoy the white clouds drifting in the bright blue sky. The first time I actually walked through a field, I saw lots of creepy crawlies and poo. Talk about a dead dream! Thanks, Cassandra! I write to "make people's nights." Yes Sudo Nimm - excellent point. Love the outfit! Ha! I know what you mean. I really love cows. They look cool and they're fun to draw. In real life, they are not so fun to be around in person ... but they still look cool. I think a lot of parents are drawn to farmyard books. They are usually cute, and fun and safe. My kid liked books about pet animals, dogs, cats, fish, that he could relate to, as well as any books about machines, cars, construction, that sort of thing. Animals are also good stand ins for adults. Probably the reason there are so many books in a farm setting is that both boys and girls enjoy the thought of all the activity of a farm. I have written two stories based on farm settings and the children liked the different areas of the farm, ie the barn and stables. It wasn't just the farmyard. Or maybe it was the fact that one story featured a singing chicken! There, that's my opnion which is probably a load of waffle, but I thought I'd say it anyway! Apparently the following are eaten, and I feel so guilty. Pheasant, ostrich, duck, partridge, goose, emu, ostrich, and of course chicken. Actually I should ask my flatmate. He does work in the Chicken Inn. Turkeys stink according to him. He won't eat it at Christmas. Now, I've made some chocolates so I'll finish this and go make myself look ugly. Dinner out tonight. It's my birthday! 1) Kids can run around on a farm, at least that's the image. Usually a 6-7 year old can't have freedom of movement in an urban area. Not since the 50s or so. 2) Kids love animals. Disney characters usually have some sort of animal sidekick. Animals live on farms. Therefore animal adventures? Perfect for farms. The poultry on the farm are certainly giving the farmer a run around. I'm near to finishing the story. One question before I go to stuff myself (probably not appropriate wording considering the topic)...What's it like to write over 2000 words and how do you stay focussed? Horrible admission on my part. I've never tried it because I tend to warble, as you can see from my posts.